This is one of my favorite recordings of the year. Vladimir Jurowski and the London Philharmonic Orchestra made these live recordings in just one take each — the First Symphony was captured on 22 October, 2008, and the Sixth on 26 November of the same year — before audience that remain mercifully silent until the final (and well-deserved) explosions of applause. The fact that these performances are so remarkable, and so worthy of being set alongside decades-old Tchaikovsky albums produced by recording-studio perfectionists, speaks volumes about the artistry of everyone involved. This set of two discs for the price of one is a necessity. 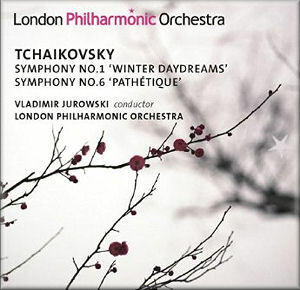 After five or six listens, I have no hesitation in declaring this my favourite recording of Tchaikovsky’s First Symphony, fancifully subtitled “Winter Daydreams.” That is not to say that it is the best; there are some highly recommended versions (say, Markevitch or Dorati) which I have not yet heard. But this new performance is something very special indeed; in fact, I have already disposed of my other recordings of the work. Jurowski’s interpretation succeeds on several levels. First of all, it is quite dramatic: the development climax in the first movement is truly intimidating, with a sheer physical force we usually associate with the Fourth or Sixth symphonies, not this alleged pastoral trifle. Equally impressively, the finale’s transitions from high excitement to lyrical repose and back again are handled with such skill that they seem not disjointed but inevitable. Second, this performance has a great sense of the symphony’s architecture. For the first time I fully felt the cohesiveness of the slow movement, so often just a pretty parade of atmospheric tunes. The way Jurowski uses each melody to set the stage for the next, his skilful rubato, and the way he handles the movement’s return to its opening material at the end, all opened my eyes and ears. It is common to say that, even when writing his First Symphony, Tchaikovsky was already Tchaikovsky. Let me add that, even when writing his First, Tchaikovsky was already a structural innovator of the highest order. But the most important success is that this performance is just beautiful! Listen to the full, rich sound of the London Philharmonic in the first movement’s climax; listen to Ian Hardwick’s extraordinary oboe solo in the slow movement (complete with a just-right touch of vibrato); dance along with the luxurious strings in the scherzo’s trio section. Special mention must be made, however, of the finale. The general consensus about Tchaikovsky 1 seems to be that it gets less inspired as it goes along, from an alluring opening tune to a finale that goes on too long and really could have been trimmed down by three or four minutes. At last we have a recording to prove that old judgment wrong. Jurowski and the London Philharmonic play the living daylights out of the finale, and the result is so thrilling, so physically exciting, that I can’t imagine anybody not falling for this music. I myself was repeatedly surprised to hear the symphony ending so soon. Here is one version that argues, convincingly, that Tchaikovsky saved best for last. And speaking of last, as a ‘bonus’ purchasers of this album will receive a performance of Tchaikovsky’s last symphony, the legendary “Pathétique.” Undoubtedly most critics will treat the programme in the opposite fashion, but I consider “Winter Daydreams” the main event. Jurowski and the LPO have put on what could be the First Symphony’s coming-out party as a future mainstream staple, and the presence of an old favorite, No. 6, on this low-priced album is a welcome bonus. I was expecting less from this Sixth, naturally, since this work has been exceptionally lucky on disc. Just consider the last three years: Christoph Eschenbach’s live take with the Philadelphia Orchestra was one of my three favorite CDs of 2008, and outstanding performances led by Paavo Järvi and Daniele Gatti were released in 2007 and 2006, respectively. Much to my surprise, this Sixth has nothing to fear from the competition. Jurowski leads the tumultuous first movement with a steady hand, and, if the mid-movement thunderclap does not scare me as thoroughly as Lovro von Matacic’s (with the Czech Philharmonic on Supraphon), the ensuing pages still whip up quite an emotional storm. The second-movement’s hobbled waltz has real grace and a beautifully light touch; the celebrated march is powerful, big and fast (8:37), with really impressive contributions by the brass. The slow movement is moving, too. I cannot say this is the best Sixth that I have heard, but that is no problem: conductor and orchestra have everything and the playing is stellar. It’s just that this offering is not really ‘special’ in the same way that the First was; the LPO’s “Winter Daydreams” made me want to tell all my friends, while their “Pathétique” just has me nodding in deep respect. No matter. Frankly, if my preference for a Sixth in digital sound remains Eschenbach’s Philadelphia account, this new LPO offering is a close second. All that remains to be said is that the sound quality is fabulous. The LPO sounds immensely appealing here, and the ambience allows everything to be heard with crystal clarity. Maybe some listeners will want a big, boomy ‘concert-hall’ reverberation, but with an orchestra and recording this good, that touch is frankly unnecessary. The bass drum’s appearances, in the finale of the First and in the Sixth’s celebrated march, rattled my (concrete) floor. Maybe the highest praise that I can give this disc is that it has inspired in me a dangerous urge to buy every CD the LPO and Vladimir Jurowski have made together. This album is the complete package: excellent design and production, superb live performances documenting a spectacular orchestra and exciting young conductor at their finest, acoustics that communicate the performances to us directly and clearly, and a budget price that makes this two-disc set cost less than the average one-disc new release. I cannot wait to hear more from this exciting partnership of orchestra, conductor and engineers. In fact I can wait to hear more, because I have this fabulous set to tide me over.